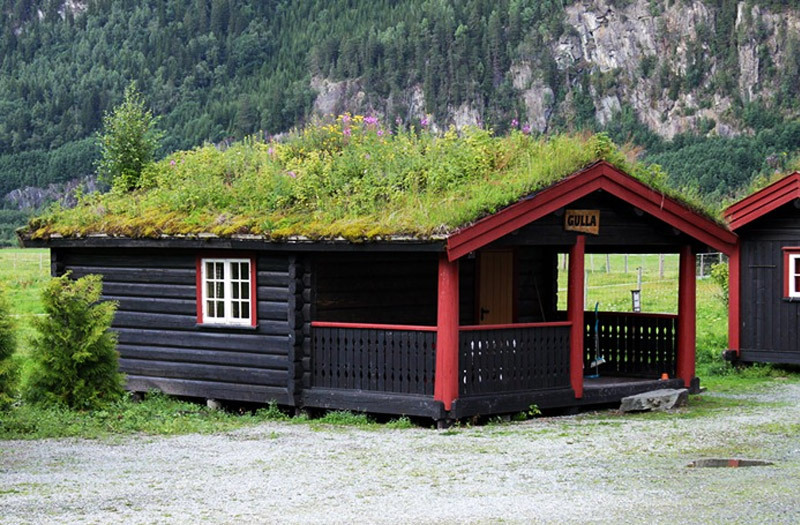 Green roofs may be a newer phenomenon in many places, but Norwegians have been planting greenery atop their houses for hundreds of years. Some have flowers mixed in with grass, creating a lush garden that just happens to keep the house below well insulated. The verdant roofs have many advantages, from maintaining regular temperatures within the dwellings to actually stabilizing the houses themselves. Green roofs have become a long-standing tradition in Norway, and it’s not common to see them dotting the country’s landscape—or in this case, essentially melding with the landscape. 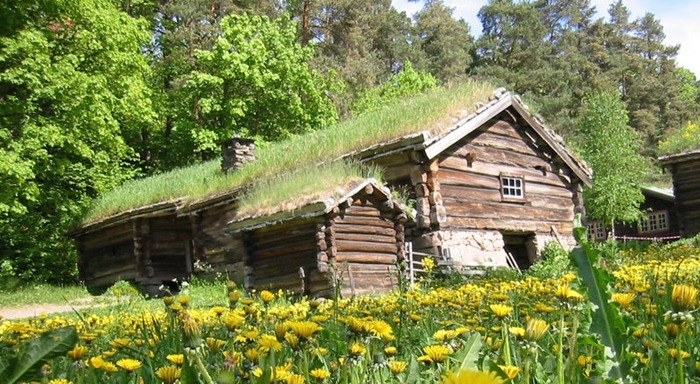 During the Viking and Middle Ages most houses had sod roofs, and they were almost universal until the beginning of the 18th century. Tile roofs, which appeared much earlier in towns and manor homes, gradually superseded sod roofs during the 19th century, except in remote inland areas. While the tradition declined and almost became extinct with the introduction of corrugated iron and other industrial materials, steadfast national romantics revived the older tradition. The renaissance of green roofs was also boosted by a growing interest in open-air museums, mountain retreats, vacation homes, and the preservation movement. In turn, many cultural and commercial institutions have integrated these roofs into the core of their design as an alternative to modern materials. Every year, since 2000, the board of the Scandinavian Green Roof Association has granted an award to the best green roof project in the region. should I construct a ramp to get my mower up there every week? Or jus' adopt a good goat that can climb---and when he's done I'll deal with the sh-t rolling off the roof on top of my enterprising head in the morning while I take my first sip of coffee.!? Hmmmmm I beleive this is a 'proximity' OR nn contingency matter of how much sh-- we can put up with. whoops! ended a sentence with a preposition AGAIN! Nice idea to reduce heat inside our home. Those trees look like they've grown through the roof, not on it. "Norwegians have been planting greenery atop their houses for hundreds of years" - who knew not me! Lazyreader has a good point about pests, termites. The home shown in picture featured in the article doesn't look safe to live in! trope have green solutions. While in the Lofoten Islands we saw some houses with sod only on 1/2 of the roof. Is there a reason for that? Good point? What about pests, insects, termites!. The house in the first picture looks like it's gonna sag and fall in on itself. Do green roofs have insurance. We choose this because it looks good. But these are heavy capital investments and if it's done wrong, you'll be looking at a new roof you're gonna have to pay for. May I be assured that insects will never disturb me from atop? Green roofs in Norway have become a long-standing tradition, and it's not common to see them dotting the country's landscape—or in this case, essentially melding with the landscape. During the Viking and Middle Ages most houses had sod roofs, and in rural areas sod roofs were almost universal until the beginning of the 18th century. While the tradition declined and almost became extinct with the introduction of corrugated iron and other industrial materials, steadfast national romantics revived the older tradition. Tile roofs, which appeared much earlier in towns and on rural manors, gradually superseded sod roofs except in remote inland areas during the 19th century. The renaissance of green roofs was also boosted by a growing interest in open air museums, mountain retreats, vacation homes and the preservation movement. In turn many cultural and commercial institutions have integrated these roofs into the core of their design as an alternative to modern materials. Every year, since 2000, an award has been given to the best green roof project in Scandinavia by the board of the Scandinavian Green Roof Association. Structures blend well with the surrounding landscape, to create an uninterrupted aesthetic. Given the brisk and often low temperatures experienced, the roofs provide excellent, natural insulation. Even large manors will integrate a green roof in their design. Green roofs go even greener with skylights.